Ooo la la well finally we got to see a competitive match against the young Belgian Goffin. After watching Roger play in practice mode for the first three rounds it was about time we got to see something interesting and we weren't to be disappointed. Goffin came out and played first strike tennis that Fed couldn't live with for the majority of the two opening sets. I don't know if Roger thought Goffin was a ball boy for the opening set but he wasn't able to find the range on his return or his ground strokes. The Belgian protégé (which I have now nicknamed him) was moving great and causing Roger so many problems with his backhand down the line. Like no doubt every commentator around the world said, he was playing tennis wise beyond his years and showed zero sign of nerves. Even though he started like a bullet train I thought Roger would come good at the end of the first set and raise the bar. WRONG. At 5-6 and Roger serving to stay in the first set Goffin fashioned 3 break points, Roger saved two of them only for the Belgian to fire an immense forehand winner up the line on the run. Game on! The second set was also more about Goffin and he really was brimming with confidence. For a young guy playing his first slam he really did make the right decisions at the right time and some of his feel around the net was top notch. He takes the ball very early which I have no doubt would have caused all the top players problems, it doesn't matter whether you're Fed, Nadal or Djokovic he was on fire. I've talked a lot about Goffin so far you'd think Roger was invisible in this match, he wasn't and in fact he had to play well just to even stay with the Belgian. At 4-5 Roger slipped to 15-30 and got big time lucky when Goffin netted a regulation backhand when he was well on top in the point. This was the one moment where he made an error, it cost him and the momentum switched onto Roger's racket. After Fed held to make 5-5, he broke after Goffin made a string of errors including a double fault and took the second set 7-5. From there on it was really Rogers match, he started playing a lot better and timing the ball like he usually does. 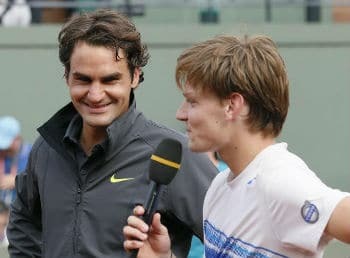 Understandably Goffin started to tire and Federer began to play more freely, the Belgian was still coming up with shots from time to time but ultimately Rogers class showed and he ran out a 5-7 7-5 6-2 6-4 winner to make his 32nd consecutive Grand Slam Quarter Final. If you're a tennis purist then this was by far the best quality match of the tournament, point construction, shot making, technique, use of angles, court craft this match had it all and surprisingly early on in the match it was Goffin who was the better of the two. Goffin takes the ball so early and he really caught Fed off guard. The better he played, the better Roger played which was a good sign. I'm still not sure Roger is at his best though or truly happy with his game but only time will tell on that front, he's in the Quarters where he'll face Berdych or Del Potro. A match against either of those two will require him to up his level again and that match will serve as a barometer of where his game is at right now. Going back to Goffin I really hope he's not a flash in the pan and his career keeps moving forward. He played well today but it's important that he carries on from here and keeps improving. For a guy that's so slight in build and weighs nothing drip wet he really does hit the ball crisply. He moves great too which is a huge asset to have. Is he the next big thing? Who knows, but I'd like to think he will be a regular fixture in future Grand Slams. Because play was suspended we're still none the wiser to who Roger will meet in the Quarters so I can't make a prediction. Currently Del Potro is leading two sets to one. Before bad light suspended play momentum was with the Argentine as he took the third set 6-3. I'm not sure how bad his knee is but he's clearly in the driving seat and a days rest may help. Berdych is still in touch though so I'd really say this a coinflip. I'll be back tomorrow to update once the result is out. Well well well, Del Potro made it through in 4 sets, impressive stuff. I thought Berdych was going to win that but clearly not. I didn't see a lot of the match although I do know Berdych has played a lot lately so perhaps wasn't as fresh as he can be, but no excuses, Del Potro must have been the better player. I think Del Potro is a better match up for Roger, he has a bit of a hold over him since he lost to him in 2009 and has beaten 4 times already this year. Del Potro is already carrying a knee injury so if Roger is smart he will move him around the court and mix it up with the drop shot and shot slice. I think Fed will have to up his game from previous rounds but he should be able to. It might be close but if Roger loses I will be surprised to say the least hence why I go for Fed in straight sets 6-4 6-4 6-2.
was indeed a treat from Roger.. I would very much like to see Goffin around in the future slams as you mentioned.. Roger might need to step up his gears from now on, and after the match of Djoker, i would sat Tsongs/Wawrinka might have a chance to meet Roger if they can pull up a surprise win against the Serb.. poor Seppi didnt have the momentum when he needed the most.. It gets interesting from here on !! Allez Roger..
Yeah I like Goffin, he was a breath of fresh air! Not sure Djoker will lose to either of those two though, winning in 5 sets will have given him confidence, although he still has the pressure of winning the Nole slam on his back. Berdy and Del Po in a tough battle too. While I like Goffin’s style of play, he reminds of Dolgolpov, but more conventional and with more control, I was most impressed with his attitude and mental game. I really hope his game improves and he stays injury free because he is a treat to watch. Yeah he plays well. Least he’s aggressive and takes it early, hope we see more of him. I watched Delpo vs Berdych and I have to say there was nothing wrong with Delpo’s movement. If Roger is to win it’s gonna take a rise in his level of play and a tough battle. Now that it’s clear JDP will be facing Fed in the quarters & he’s struggling with knee injury, I think Fed will win in 4 sets (considering he’s lost a set in each of the last 3 matches).. Back in 2009 they met in the semis here, Fed won the 5-set thriller.. So, Fed has nothing to lose against JDP.. Lets see..
Yeah, I think he has Del Po figured out, but you never know the Argentine may surprise. You were right Ramesh, for 2 sets that terminator forehand was on fire! Crazy. Glad he got the win, interesting match with Djoker now. How much part do you think the injury played? Great comeback for Fed. Waiting anxiously for your post on the Delpo/ Fed. Match. Great to be a Fed fan. Very proud of him today. Indeed, how much of a part do you think the injury played on the outcome? Very positive he came back from 2 sets down.